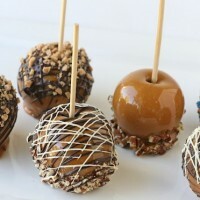 Before we say good-bye to summer, let’s enjoy one more cool treat! 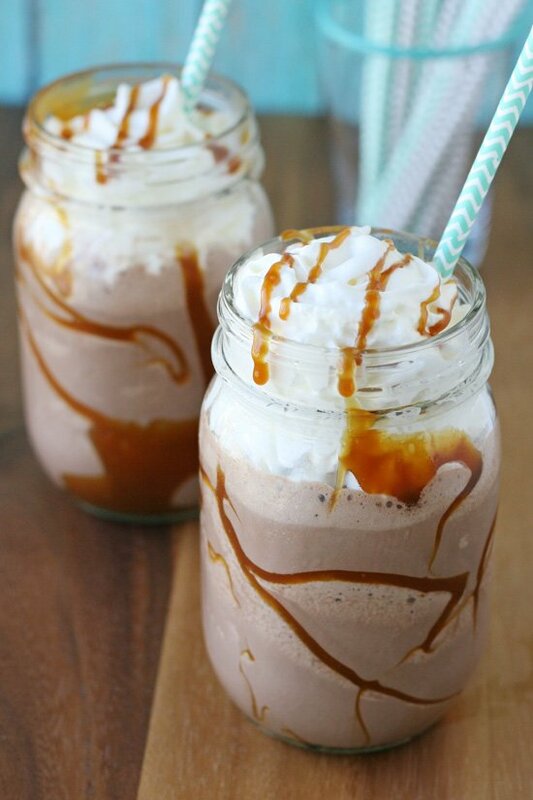 This Caramel Mocha Milkshake combines all of my favorite flavors into one amazing treat! Caramel, chocolate, coffee, whipped cream… yep, it’s pretty much bliss in a glass! You wont believe how easy it is to make this fancy coffee drink that would rival any coffee shop creation! I was recently sent some Millstone coffee to try and to “play” with. I love good coffee, and especially love making fancy coffee drinks at home. 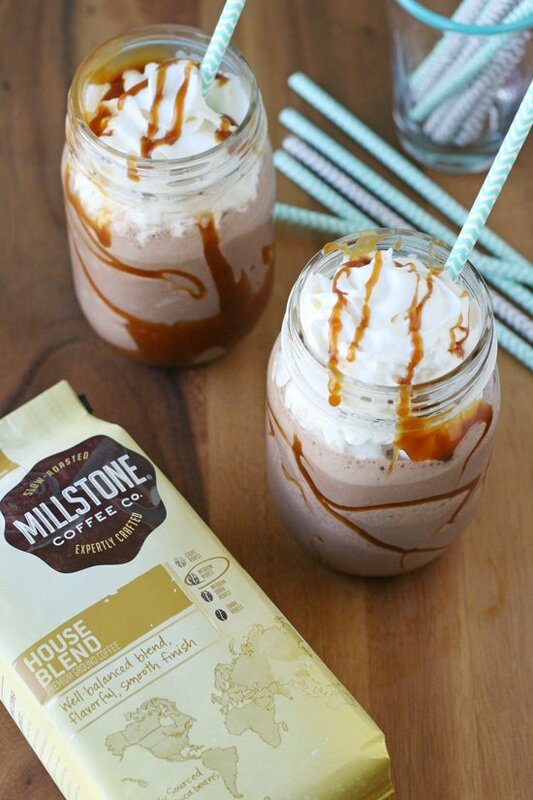 For this Caramel Mocha Milkshake I used Millstone’s House Blend. The House Blend is a well balanced, medium roast coffee. For those of you who love an even deeper flavor, Millstone has a new dark roast, Mayan Black Onyx. This rich, full bodied blend is Certified USDA Organic and Fair Trade. Either delicious Millstone variety would work well in this milkshake recipe. As the weather cools off and you’re ready for a warm drink, replace the chocolate ice cream in this recipe with hot chocolate for a warm and satisfying treat! You can find more information on all of the Millstone coffees, as well as more delicious recipes at Millstone.com. 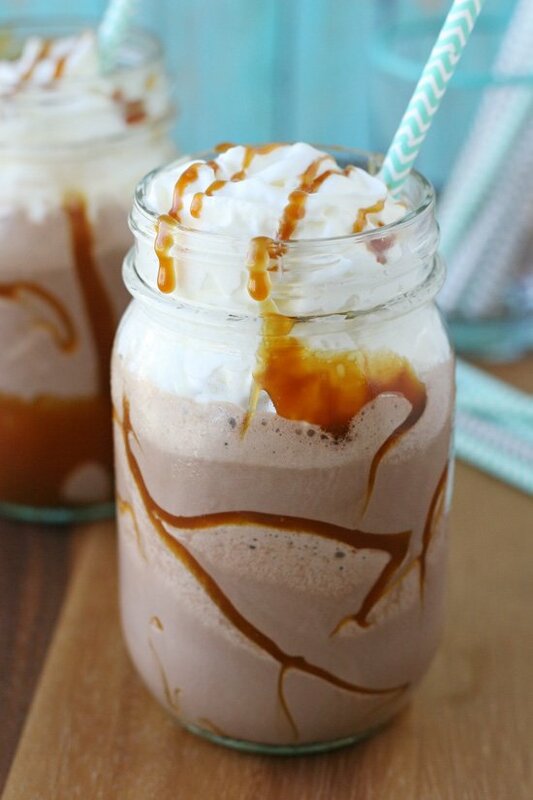 Caramel, chocolate, coffee, whipped cream... this milkshake is bliss in a glass! Brew coffee, then set aside in the fridge to cool. When the coffee is fully cool, add coffee and about 2 cups chocolate ice cream to a blender and blend until smooth. Add additional ice cream as needed, depending on desired thickness. Heat the caramel sauce if needed, then drizzle some caramel along the inside of 2 glasses. Fill glasses with coffee/chocolate milkshake. Top milkshakes with whipped cream and an additional drizzle of caramel. 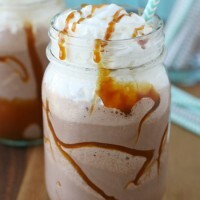 This Caramel Mocha Milkshake is a delicious afternoon treat! For a perfect morning pairing, enjoy a hot cup of Millstone coffee with a fresh baked treat such as a Morning Glory Muffin, or Pumpkin Cinnamon Streusel Muffin. Disclosure – I received products and/or payment from The J.M. Smucker Company for my work creating this post. I only share products on this site that I use and love. All images, text and opinions are my own. Oh man, where is my straw! I need one of those right now. 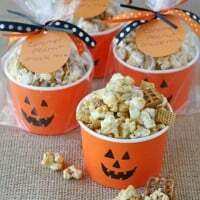 It looks soooo delicious! 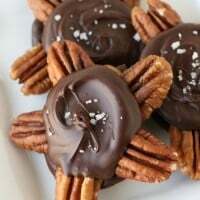 We are all congested here at the Adams’ House, but as soon as we are feeling better, we are going to have these to celebrate. Man this looks good. I want to be drinking one of these right now! Wow! I just might have to buy some coffee to try out this recipe! Love you! This looks so good!! Makes me want to make a milkshake. with your recipe. If it tastes like it looks I should be in heaven. Thank you for sharing this with us. You take very lovely pictures. What kind of camera do yoy use? 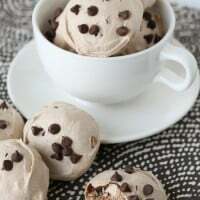 Pingback: Fruity Ice Cream Floats - Chocolate Chocolate and More! This looks amazing I am going to try this tonight. I made this with vanilla soy ice cream and chocolate hazelnut syrup rather than chocolate ice cream, turned out delicious.